What's the big deal, Mom? It's just a tattoo! 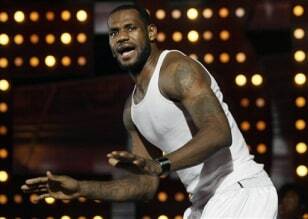 This July 10, 2007, file photo shows NBA player LeBron James as he rehearses for the ESPY Awards on stage at the Kodak Theatre in Los Angeles. LeBron James has earrings in both ears and has numerous tattoos. Even though piercings and tattoos are becoming more mainstream, the right age for getting one is a subject that parents and teenagers often disagree on.